Omron HBF-400 Body Fat Scale - FREE Shipping! 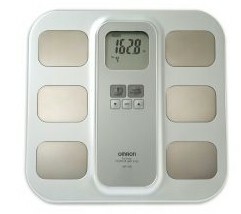 The Omron HBF-400 body fat scale / body fat monitor is designed to help you lose weight -- plus maintain that weight loss! The Omron HBF-400's easy-to-read display shows your weight, body fat percentage, and BMI (body mass index) -- all in just seconds. The Omron HBF-400 lets you track your weight, monitor your fat loss and see your progress with one, easy to use scale. 4 person data storage with previous measurement results -- use one scale for the whole family!